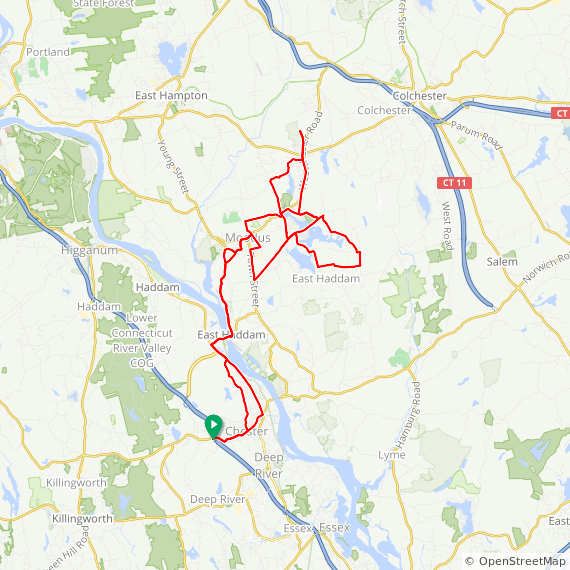 Description from CTBikeRoutes: This ride is over mostly rolling terrain (with a couple very hilly sections) and travels up into and through Moodus via the East Haddam swing-bridge and features stops at Johnsonville Village, a suggested lunch/snack stop at Day Pond State Park, views of the Moodus Reservoir and Bashan Lake, a re-crossing of the Connecticut River via the swing-bridge and a relatively mellow return route to the commuter parking lot. This is a challenging ride and should be attempted by only those in excellent physical condition. Start: Rt. 9 Exit 6 commuter parking lot (Rt. 148) in Chester CT.